Summary: John C. Maxwell’s Put Your Dream to the Test is an inspiring book that will help you get motivated. But it also offers a doze of realism so you don’t get lost in lofty ideals you can never achieve. 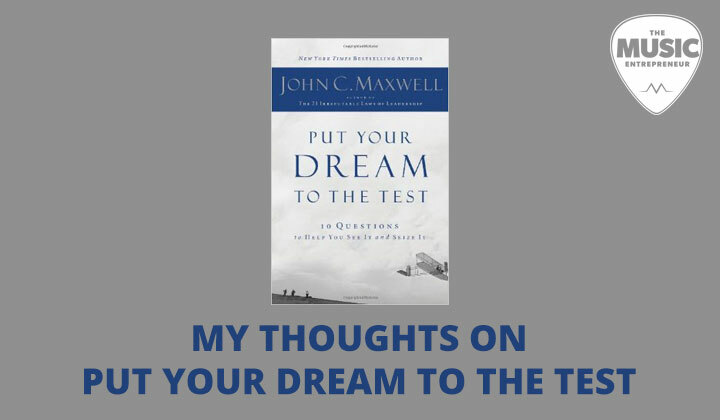 I recently read Put Your Dream to the Test by John Maxwell. I’ve read many Maxwell books to this point, and I’ve certainly taken away a variety of useful tips. This book was no exception. In this review, I’ll share what I learned and what I thought about the book. Put Your Dream to the Test is a practical – if intimidating – guide to determining the viability of your dreams. Author John Maxwell will guide you through the 10 questions you need to ask yourself if you’re to have any hope of achieving your goals in life. Your dream is your own. You have a clear vision for your dream. You are depending on factors within your control. You are passionate about your dream. You have the right relationships and connections. You are willing to pay the price for your dream. You have the tenacity and persistence to follow through. You are fulfilled by the work you have to do. Your work will benefit others. A great book to start the year with. If you’ve ever wondered when you’ll be given the permission to start pursuing your dreams, and you have no idea what it’s going to take to get to where you want to go, then this is a must-read. But no sooner do you open it when you realize this book requires real work. You must think, reflect, examine yourself, journal and answer questions (the 10 primary ones as well as the many others at the end of each chapter). If you’ve read a number of Maxwell books in the past, you know exactly what to expect from this, but it’s still a great read with many good quotes and tips for those who are earnest about their goals and dreams. At this moment in time, I only know what I want to accomplish in the next year or two. But this is better than not having any idea, and it’s the furthest I’ve been able to see ahead in a while. Maxwell talks about people with predispositions similar to mine – relaxed and laid back, but steady and consistent. I’m glad he mentioned how people like me can use our nature to our advantage, as many success books blow right by this. Do I really need people to help me achieve my dreams? Yes, I do, but I need to give this more thought. I’ve already identified several areas where I need help – masterminding and collaboration, marketing, administration, bookkeeping, and general tasks that eat up too much of my time. How many times does a person need to pay the price for their dreams? Maxwell says you will need to keep paying as long as you have bigger goals. One of my theme words for the year is helpfulness. So when I ask myself the Significance Question, I am alerted to the fact that I need to remain focused on serving others. My work is most effective when I’m offering something people want. For obvious reasons, I can’t talk about everything you’ll learn about in this book, but I hope what I’ve shared is helpful. If you want to delve deeper, then you’re going to want to purchase the book for yourself (get it on Amazon – this is an affiliate link). This is a worthwhile read, though it’s not a book I would read every year. I think it would be ideal for when you’re changing course in life, or when have new goals and dreams that must be examined in light of your strengths and capacity. By the way, I’ve made a list of every book I’m reading in 2016. I may not be talking about each of them here on the blog, but I hope you enjoy the insights I share with you.